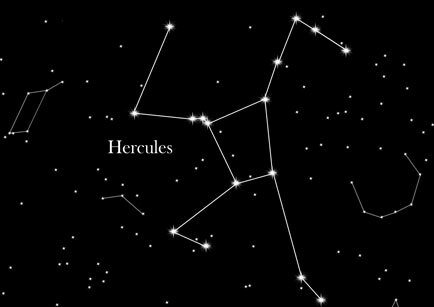 The constellation of Hercules is one of the 48 classical constellations mentioned by Ptolemy and it is one of 88 modern constellations. It is the fifth largest constellations in the sky. The name of the constellation in ancient Greek is “Engonasin” which means “kneeling”. In Greek mythology, the “kneeling Hercules” represents Hercules’ remorse after he killed his wife and children in delusion. Hercules is represented as "a kneeling man." Although Hercules is the fifth largest constellation in the sky, only three of its stars are brighter than magnitude 3. Its brightest star is Beta Herculis, with a magnitude of 2.8. It can be found between the constellation of Lyra and the distinctive "Northern Crown". Hercules is in the direction of our Apex and is moving along with our planet with a speed of 20km / s at this point. For star watchers Hercules contains two interesting globular clusters, which can be observed even with a relatively normal pair of binoculars. According to Greek legends, after Hercules, son of Alcmene and Zeus, had slain his wife and children out of anger, he was devastated with regret. King Eurystheus then assigned him the legendary “Twelve Labors” tasks to help him right his wrongs. He excellently completed the “Twelve Labors” tasks, then built a funeral pile on Mount Eta, destroying his mortal body. His soul then joined with his father Zeus and other gods on the sky.